It’s true – people aren’t collecting like they used to. It’s time to greet the next generation. Published on Friday, April 21, 2017. This article appears in the April/May 2017 issue of American Craft Magazine. Graham Rae, © Mark Hill Publishing Ltd.
Accumulation has gotten a bad rap lately. Declutter and simplify your life, the wisdom goes, and you’ll be happier, healthier. And while you’re at it, trim your space, too. Tiny homes are the next big thing, a trend driven not only by crowded cities and economic forces, but also a cultural shift in what it means to live a good life. In these narratives, a lot of stuff – be it clothes, cars, or home décor – isn’t part of the plan. But what if there’s a different way to view things – and, specifically, their acquisition? If there’s anyone who could turn this tide, our money’s on Mark Hill. While he’s perhaps best known as an antiques and collectibles expert on the BBC Antiques Roadshow, Hill is also an author and publisher, lecturer, consultant, exhibition juror, and dealer, who’s not afraid to call it like he sees it. And what he sees is a vision of collecting that’s worth investing in. As an expert in antiques and collectibles, you’ve had an impressive career – but also a precocious one, beginning with a job at Bonhams right out of college in 1996. How did you know this was your path? Well, I’ve always collected something, and I don’t know anyone – and have never met someone – who hasn’t [collected something] at some point in their lives, be it shells or cool stones from a beach to dinosaur toys, action figures, or stamps. There’s something that’s attractive to us as humans – that need to accumulate, that need to learn and better yourself. When I was at university, I studied history of art and architecture – and decided to try pursuing it as a career. Some parents would say, “Oh, goodness gracious, don’t be silly.” But actually it’s one of the only times in your life when you’re able to take that chance and see whether it works. And my parents were incredibly supportive, being very sort of liberal in that way. So I went into the auction business as a porter to see what happened, and I was very lucky and got a full-time job. So I worked for Bonhams for the auctioneers and then moved on to Sotheby’s; then I worked for a dot-com that had an exclusive alliance with eBay, which I ran for a number of years. And then of course I worked with Judith Miller on the Miller’s price guides. I set up my own publishing company. I do a little bit of dealing. I set up Antiques Young Guns, to encourage younger people who really want to work in this business and have that passion but not necessarily the contacts or the structure and support network out there, especially in this online age. So it’s been great. I’ve loved it. I’m interested in this idea that collecting fulfills a human need to learn. Is there anything else that collecting does for us? Well, I think it’s learning, but I think it’s also understanding, and it’s stories. A lot of this is, if you like, deep stuff. When we’re young, our parents read us stories, or we read stories in books. We see through the eyes of historical characters or fictional characters, and we’re transported somewhere else. And I think as human beings we love that. There’s that desire to learn, to understand the world around us, who we are and what makes us who we are. This doesn’t change as you grow up – these stories are still as seductive, but much more varied. So I think collecting helps with that. I think it takes us on amazing journeys that take us outside our lives and into other places and other times. Being a collector doesn’t mean that you will have trouble opening your front door or spend eons dusting shelves of stuff; it just allows you to escape to another world, time, place, or culture. Or to simply appreciate the craftsmanship and creativity behind how something was made. What you’re saying brings to mind how we talk about the way objects can tell stories, how they can hold meaning beyond their physicality. Oh, without a doubt. And I think it’s experiences as well. You know, an accountant who collects something like studio pottery – an accountant is used to dealing in a very rigid way with numbers. But studio pottery is very tactile, a very different experience. What’s your approach to collecting? Does learning drive you, or are you seeking experiences, something you love? I think a little bit of both, to be quite honest. I mean, I appreciate the obvious visual appeal of some things. So if something is a beautiful object that shows the great handcrafted side of things or that just makes you smile, I think that’s obviously one element. But for me it’s also the story. What really fires my collecting these days, having now been in the business for 20 years, are the objects that haven’t had their stories revealed yet. I’m looking at a collection of midcentury modern glass at the moment. I find them fantastic in terms of their form and their color. But nobody knows who made them. I’ve been collecting them for eight years now, and I sort of don’t care. But one thing that keeps driving me to buy them every time I see one is, you know what? I know there’s a story out here, and one day, I’m going to find out what that story is. And that’s going to be really exciting. Is that something that you’ll uncover through the process of collecting? How do you seek that moment of discovery? Well, I suppose a number of ways. I worked on a book called Alla Moda, which is about Italian pottery of the 1950s and ’60s. There were certain names we knew about: Guido Gambone, Marcello Fantoni, Piero Fornasetti. There was also a whole raft of low- to mid-range pottery that was very simply marked, just “Italy” with numbers, or sometimes just “Italy.” And we didn’t know who made them. So a colleague and I started to collect these things, because we found them very appealing and the quality good. He, in particular, started to amass a collection. And when you amass a collection, it enables you to build up threads. You start to notice that maybe a color of a glaze is found across a certain selection. Or maybe there’s an element, like a rim shape, that you start to see. And in this instance, he collected several hundred of these pieces. I just had a few dozen. But what we were able to do was identify a completely forgotten factory. It was quite an amazing experience. We amassed his several hundred pieces, my several dozen, all in one room, and we put them in rows. There are the ones with blue glazes. There are the ones with a similar glaze technique, but they’re pink. And we identified certain ranges, and then a factory, because we found one or two with a label and a mark. It was a place that had been completely forgotten, called Fratelli Fanciullacci. At some point in the 1960s, the River Arno had flooded and destroyed the factory and its records. And since the ’60s, it had just faded from consciousness. So that’s what, in sort of revealing a story, a collection can do. It allows you to draw things together, pull threads out, and then start to identify ranges. And then once you’ve done that, if you’re lucky and you find one with a label and with a mark, you can then go to the books, you can go to archives, to museums – we used a lot of original sales documentation. So we were able to sort of draw this story out from just, effectively, filling a room with pots. That sounds amazing. Filling a room, though – that image reminds me that collecting has gotten lot of bad press lately, with this emphasis on smaller homes, on decluttering. Do you think this trend is changing or will change collecting? I think it’s already changed all of that. But I think it’s on the cusp of changing again. What initially changed was a particular Scandinavian superstore – I won’t name it, because it’s like that Shakespeare play now, isn’t it. They sold us this very clean, minimal way of living. And it was incredibly seductive. It was very different from what we had seen before; it was different from what our grandparents had. It was a mile away from, you know, the Georgian dining room or the collection of teacups and saucers. But what we’re now finding, maybe 20 years into it, is that suddenly your home became very devoid of personality. So you’d go to your best friend’s for dinner and see that they had a Billy bookcase or that funny little square table. And you’d go, “Oh, you’ve got one, too.” And that’s where it ends. I think we began to realize that our homes had lost personality. They’d lost interest; they’d lost the fact that they are our homes. So now I’m seeing a lot of people coming back to collecting – but on a very different level. People are suddenly realizing that they don’t want that home that’s devoid of personality. They’re bringing things that have meaning for them, but also have a very clear visual appeal. Maybe you’re in a French flea market, and you have one too many glasses of wine at lunch and you buy a vase that makes you laugh. And you put it on display – and every time you see it, you smile because you remember your lovely holiday. And that’s what the Scandinavian megastore and all of that minimalist idea doesn’t let you do. It takes your personality out. I think this has also come about because economically we’ve had real trouble over the past couple of decades. I don’t want to get us into a political discussion, but we’ve got the dawning of a new president called Mr. Trump, we’ve got Britain moving out of Europe, we’ve got the rise of China. There’s an awful lot, not just economically but also socially and politically, that’s worrying. Some of us can’t afford to go out as much. And I think our homes, ever more than before, need to be our nests. They need to make us feel comfortable. They need to reflect us and make us happy. Ikea doesn’t let you do that. No, it doesn’t. I’ve found that having handmade objects in my home makes it feel cozier, more cheerful. It just makes me happy. Which is similar to what you’re talking about. You know, this is funny – I know a couple of dealers, who I’ve known for 15 years as selling primarily midcentury modern objects and some nice art deco pieces. But when I went into their shop over the past six months or so, I’ve noticed that they’re selling small wooden items, little pieces of treen, if you know what that is, and sort of quirky little bits of studio pots and studio glass. And they said that they’re seeing a younger generation reacting more to that, because of exactly what you just said. It’s stuff with a story. It’s handcrafted. It’s indicative of the time it was made in and the society it was made in. It’s everything that the mass-factory-produced thing from China isn’t. So it’s got a story. It’s got soul. That’s what it is – it’s got soul. So do you think there are generational differences in how people are collecting? I do. I really do. And nowadays, there are no rules. And I think that’s important. I lecture to NADFAS regularly, which is the National Association of Decorative and Fine Arts Societies. And that’s an age group that’s primarily retired, so they’re people in their 60s, 70s, 80s. And when they were collecting, they would tend to buy fairly strictly. So if you wanted a Victorian living room, that’s what you would buy, you would buy Victorian pieces. And they had to be of a type, and they had to work, and it had to all fit. Today, I see Victorian glass vases displayed on midcentury modern dressers. And similarly, I see midcentury modern vases displayed on Georgian sideboards. It’s all about the visual appeal and the meaning to the person buying it. And for me, that’s the core of this new generation of collectors. People in their 20s, 30s, 40s – that generation gets a hard rap about collecting. People say, “Oh, no, no, no, they’re not interested in buying this stuff anymore.” Well, it’s how it’s presented to them. It’s how it’s sold to them. They are collecting, but they’re doing it in a very different way. And they’re also not collecting in vast quantity. Whereas before a collector might think, “I only collect Worcester porcelain tea bowls from 1760 to 1790, that’s all I collect,” they’ll buy anything that they like the look of. They’ll mix and match. They’ll be very bold and expressive with the way they display it. But they might also only collect three things or four things. So they might have four tea bowls and one teapot. And to them, that’s enough. And when they get tired of it, they sell it and buy something else. So you could argue that it’s the way objects are presented and sold, in fact, that has not kept pace with younger generations. I think that’s absolutely true. In the gallery where you have to ring the buzzer to go in, and everything is displayed in a very clinical, out-of-context manner, in a cabinet or on a white pedestal – I mean there are certainly collectors who still buy that. But primarily, it’s a high price level and high level of expertise. For the general collector, even people spending up to mid-thousands or high thousands of dollars, I think that’s becoming less of an appealing way to buy, because it doesn’t show them how the object may work in their home. It’s not selling them the look and the appeal. So I think a lot of the most successful dealers – of contemporary objects as well as antiques – are actually showing the objects in context and mixing. So even if you’re a studio ceramics dealer, actually showing how that might work in someone’s home, rather than presenting it locked up in a glass cabinet, I think is much more appealing to those sorts of buyers. Similarly, the online forum is absolutely vital, and lots of dealers are not yet grasping fully how to sell to that audience online. Well, I agree, but I think it’s unfortunate, because we can’t change the way people are going to go. And certainly people in their 20s and 30s, and even 40s these days, have considerable concerns. They have children, probably. They’ve got mortgages, car loans, probably further education loans. Their finances are precarious. But if we’re going to try and get them to start collecting and enjoying these objects at home, we have to present them in a way that appeals to them. We have no choice. It has to happen. Similarly, I don’t think it’s fair to criticize people for having this visual approach. Lots of dealers will say, “Well, it’s ridiculous. All they’re interested in is the way it looks. They don’t care whether that’s a good one or a bad one.” Well, come on. Let’s not put them off. Let’s encourage them to get started. Don’t criticize them at stage one. So if I came to you looking for encouragement, what advice would you share with me as a new or aspiring collector? Only buy what you like. I mean, that’s the biggest rule of everything. The second one would be buy the best you can. It’s far better to have one sensational object or three sensational objects than 30 average objects. Buy the best you can, and only buy something that you love. And then the third thing would be, look, find out what it is that you like, and then find out the names and find out the terms used. 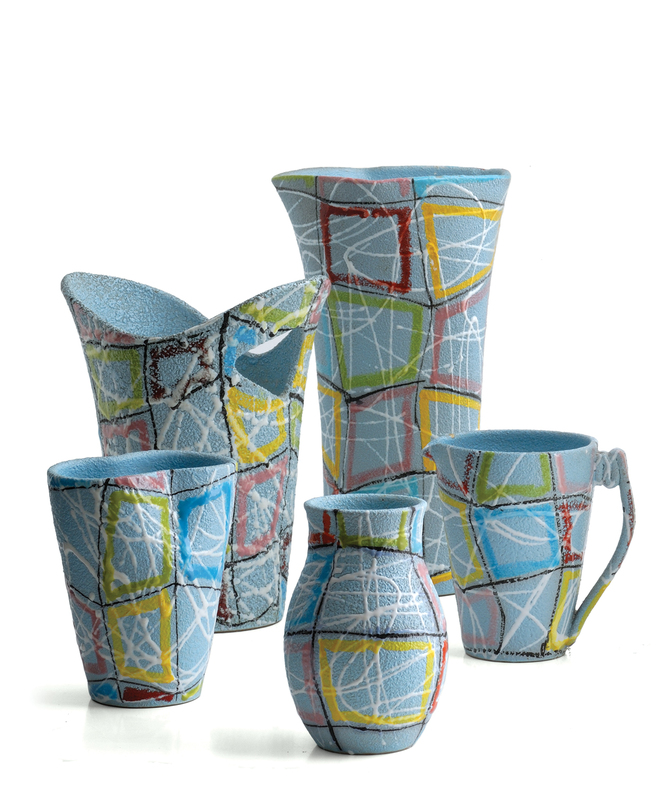 Because sometimes in the arts and the craft worlds, you get: “What is a tenmoku glaze? It sounds terribly complicated, I don’t know what that is. I’m not entirely sure how to pronounce it.” So find out the lingo that’s used, and find out who made objects that you like. I think those are key things. They may sound very simple, but a lot of people get put off beginning collecting or buying crafts or antiques because they think it’s a closed world. But you wouldn’t go and buy a new television or a new laptop without doing a little bit of research online. And actually, it’s no different with buying contemporary crafts or antiques. I’d never thought of it that way. But you’re right, whenever I make a “big” purchase – say, a piece of technology – I always research it. Exactly. So what’s the difference? And then, of course, once you’ve found out what it is you like, who made it, what the descriptions and the words are, then go to an event. I think that’s so important, because that allows you to handle the object, to really feel it and make that tactile connection with it. And I’m not being all arty-farty and funny about it. That sort of tactile experience – picking something up and building a closer relationship with it – is very important. And it also allows you to talk. Dealers, by and large, and gallerists and a lot of auction house specialists, are incredibly passionate people who want to do business with you. Sometimes they get a bad rap on television. But dealers, for example, and gallery owners, often put their own money behind these objects. They buy them, in many instances, and sell them on. So they’re going to have a passion for that object that they’re going to love to share with someone else who likes it. So build up a relationship with the object at an event – and then build up a relationship with people who deal with those objects. 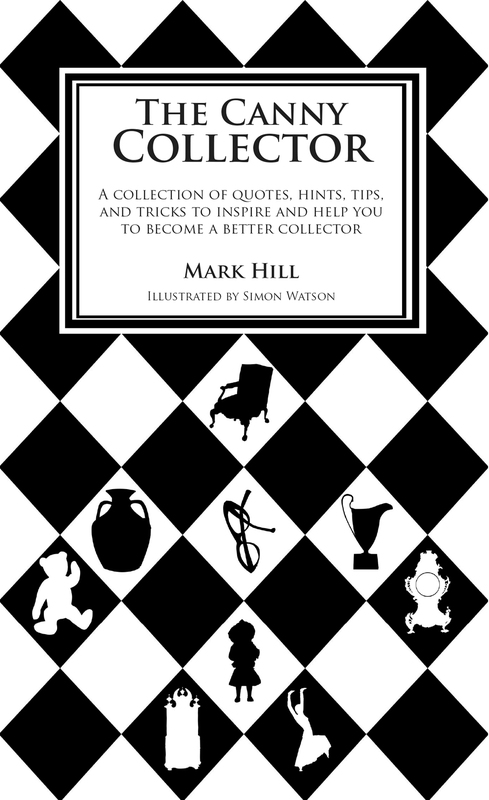 Most of Hill’s books have focused on glass and ceramics, but The Canny Collector (2013) is a compendium of his wisdom on everything from how to spot “the next big thing” to how to display your collection. © Mark Hill Publishing Ltd.
Hill tells a remarkable story about this glass bottle, which he found in the bargain bin at a Brighton junk shop. He traced its origins to Nový Bor, Czech Republic – leading to a chance encounter with the woman who painted it in the 1950s. “Moments – and objects – like those don’t come along often,” he says. Last fall was Hill’s 20-year anniversary in the antiques business. 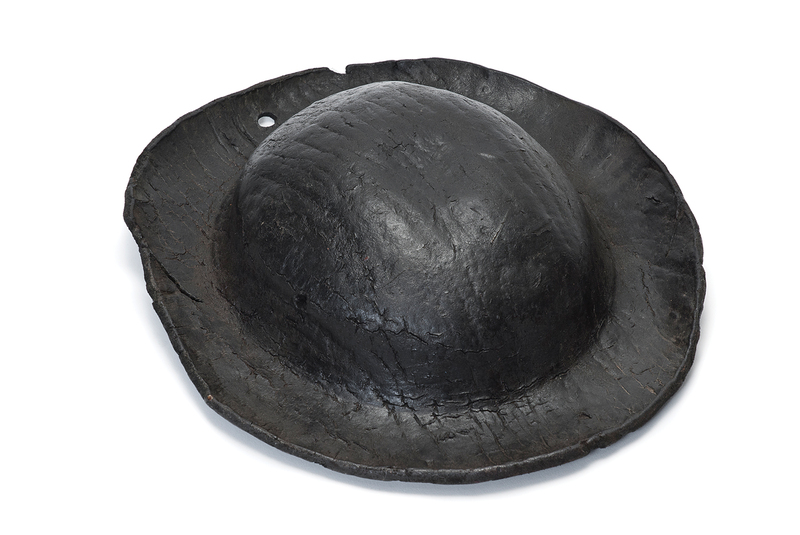 To mark the occasion, he bought this early Victorian leather miner’s hat. He appreciates its pleasing, simple form, and it reminds him of his forebears, who were miners. Jeremy Martin, © Mark Hill Publishing Ltd. Experts can be gatekeepers or guides. With his embrace of all kinds of collecting, Hill is decidedly in the latter camp. 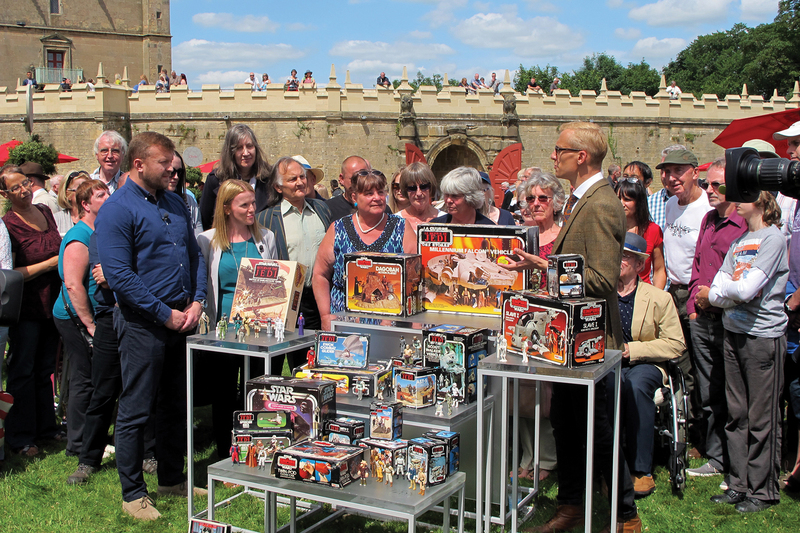 Here, he films a BBC Antiques Roadshow segment about a collection of Star Wars toys at Bolsover Castle, Derbyshire. Hill and a colleague began collecting these Fratelli Fanciullacci slip-cast ceramics before they knew their origin. Amassing a sizeable collection, they were able to see similarities, enabling them to trace the pieces to a long-forgotten factory. The tallest piece stands 10 inches. 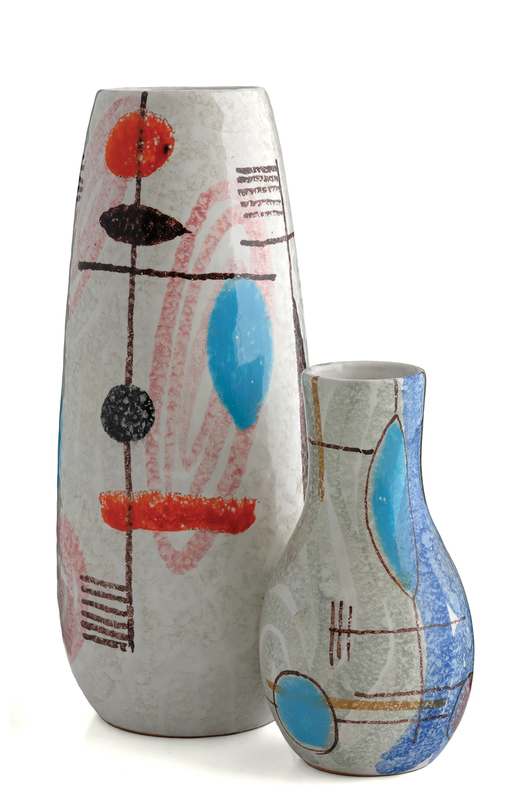 The abstract patterns on these two groups of midcentury Fratelli Fanciullacci ceramics were inspired by contemporaneous modern art. The tallest piece stands 10 inches. 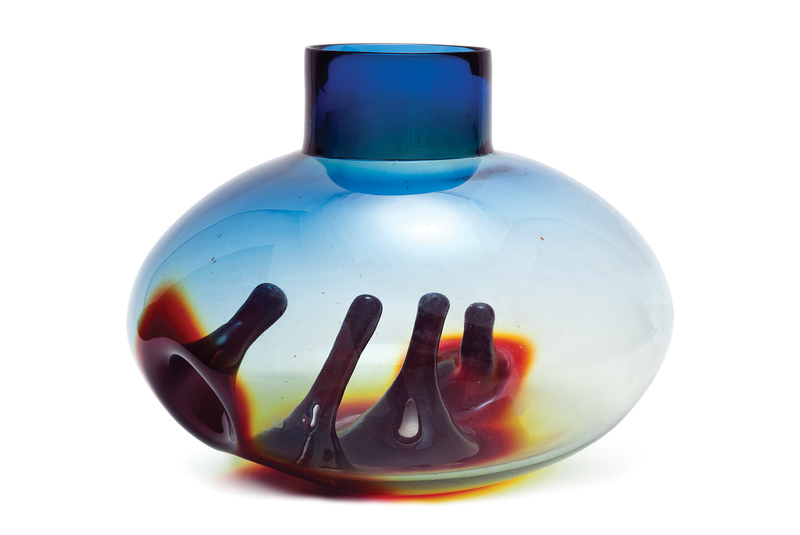 A 1960s – ’70s Chlum u Trebone Garnet and Blue heat-sensitive vase, designed by Pavel Hlava. The rare ovoid form got its unusual look from colloidal gold, along with other metals and chemicals, which alter the color of glass when it’s heated during forming. 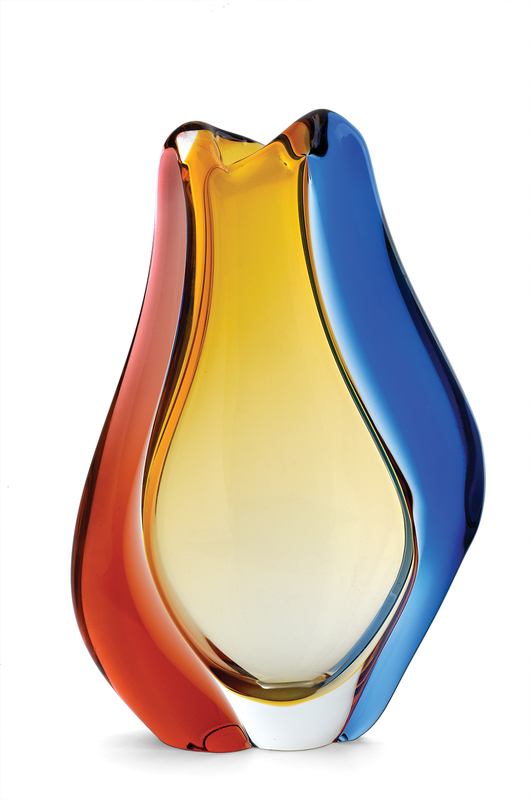 In the second half of the 20th century, Czechoslovakia became a hotbed of glass design, which the country’s communist leadership didn’t see as a subversive threat (unlike modern art). This Mstišov or Moser Romana range-cased vase with applied straps was designed by Hana Machovská in 1961. 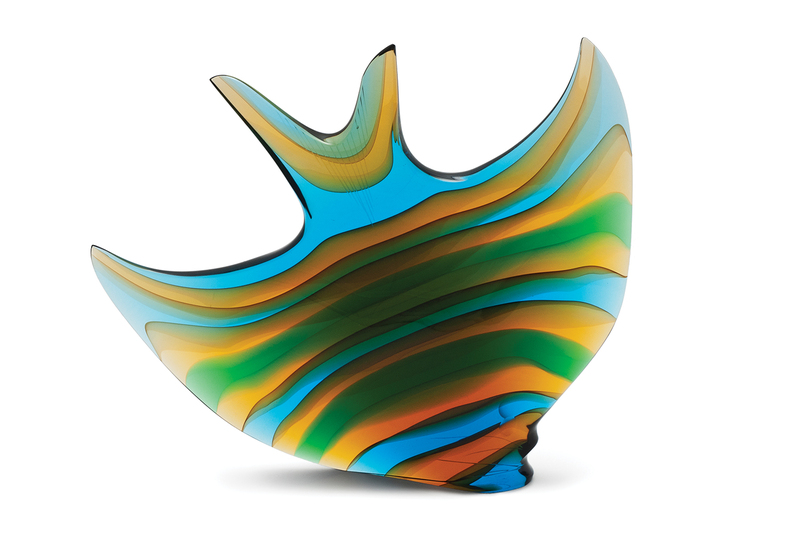 This 9-inch tall Exbor Scalare – or angelfish – of cased, cut, and polished glass, was designed by Stanislav Honzík and Josef Rozinek beginning in 1958. 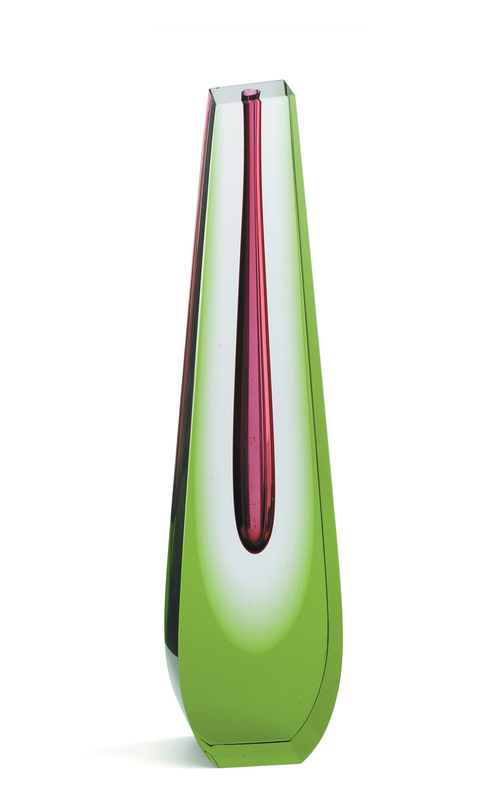 An Exbor cased, cut, and polished Monolith vase, designed by Hlava from 1958 onward.